Everybody loves meatballs. I think meatballs are an example of Americana and they belong on the American table. This is a great and simple recipe. It calls for three types of meat, but a combination of any two—or even a single meat—will work as well. The recipe makes four dozen meatballs, but you can cut it in half and it will work just as well. The sauce and meatballs freeze well, but are best frozen in smaller quantities (1/2 pint, or six to eight meatballs and sauce) so that they reconstitute quickly. This Meatballs recipe is also known as "Polpette di Carne." It appear in Lidia Bastianich's special, Lidia Celebrates America. It also appears in the Lidia’s Italy in America cookbook. Begin the sauce: Heat the olive oil in a large pot over medium heat. Toss in the onion, and sauté until it turns transparent, about 2 to 3 minutes. Ladle in the reserved pasta water, and simmer the onion to break it down, about 2 to 3 minutes. Once the water has cooked away, sprinkle in 1 teaspoon of the salt, the bay leaves, and peperoncino. Let the peperoncino toast for a minute, then pour in the tomatoes. Slosh out the tomato cans and bowl with 4 cups hot water, add to the pot, and stir. Stir in the remaining teaspoon of salt, and bring the sauce to a simmer while the meatballs finish baking; simmer sauce about 10 minutes more. When the meatballs have finished baking, gently add them to the sauce and return to a simmer. Simmer, shaking the pan periodically to move (but not break) the meatballs, until the sauce is thick and flavorful, about 1⁄2 hour. Plop the spaghetti back into the empty pasta cooking pot. Add half of the sauce (with no meatballs) and toss. Set in a hot bowl, and top with meatballs and additional sauce if necessary. 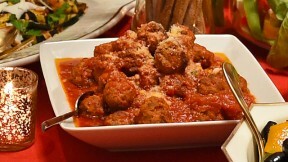 Serve immediately, offering the remaining sauce and meatballs at the table with the grated cheese.